2BK Defense | Mediterra - Swim & Run Better Than Ever! If Sun Yang can set a World Record using the 2BK for 14/15 of the 1500m race – at an average pace of around 58 seconds per 100m, then we have to consider how effective it might be for you and I, when executed well. That kick was a marvel of energy conservation and the application of force with perfect precision. 58sec per 100 meters is an impressive split and MOST SWIMMERS out there in the world would be proud to have that as their 100m sprint time. Wouldn’t you? So why would you quit exploring the potential of a 2BK just because it was hard to learn at first? 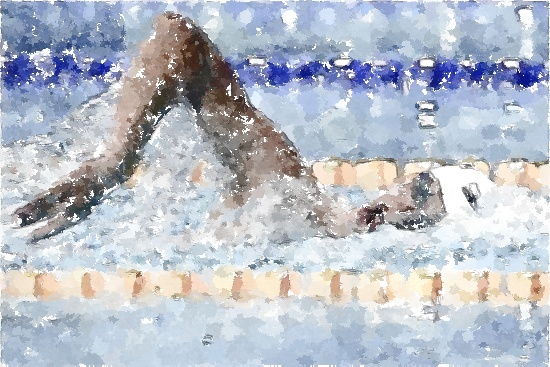 Don’t cop out on trying to master it – or at least admit it, if you do cop out – but don’t diss the 2-Beat Kick as something suitable only for slow, or long-distance swimmers until you have exhausted its potential at a 58 second 100m pace. That should influence the expectations we set for it’s usefulness at higher speeds. For example, there is no doubt (in my mind) that 2BK with full-body sync, done well, is far more efficient and suitable for triathletes and their need to exit the water refreshed. The relaxation and energy savings that comes from full-body synchronization will translate into a massive boost of energy available for the transitions, cycling and run. As they say, in triathlon the swim leg may not win the race, but it can cause you to lose it. Learn to be precise and effective with the power you’ve got on hand right now, learn to use the forces of nature freely available around you, and let those take you as far as they can. When you’ve exhausted the potential of perfect technique, then let’s talk in more detail about generating more power upon your perfect technique then see how far that can take you. What you are not willing to accomplish with technique you will have to make up for in power. And in terms of physics, technique-oriented approach will be far less costly than a power-approach. Though Sun Yang is not a ‘TI Swimmer’ (that we are aware of) we do see him demonstrating several of the principles we advocate and teach in TI stroke technique and racing strategy. In my assessment his stroke style requires less power yet allows him to travel faster (sustain a faster pace) than his rivals. He has obviously trained to use, not excessive power, but just enough power on top of brilliant technique, and it works very well for him. So I encourage myself and you – settle for nothing less than the best technique in yourself, and for yourself.